With three towns near your farm you will have a variety of festivals to participate in. Some of the festivals are town specific, and others are joint-participation with all three towns. It is up to you if you want to participate in a festival. If you do join the fun, you will increase your Friendship Points (FP) with the villagers who are involved. Some festivals may reward you with prizes and other goodies. The calendar in your farm house will outline the festivals planned for the season. As you unlock the towns, more festivals will appear on your calendar. The leaders of the villages (Megan, Tototara, and Ginjiro) will visit your house in the morning when a new cultural festival will take place in their town. For competitive festivals, MC will let you know in advance. Cultural festivals will highlight the uniqueness of each town. The town leader will be standing outside of their town gate in the Crossroads for a cultural festival where the villagers gather together to celebrate. 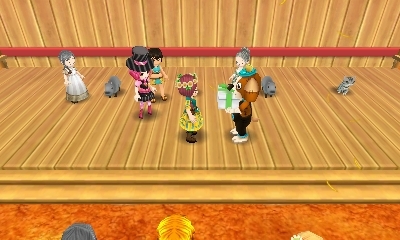 Competitive festivals will challenge you to compete against other villagers. A festival judge will rank your festival entry against your competitors, and the winner will receive a prize and a brand upgrade. These festivals are lead by MC and the festival judges, Woofio, Matsuba, Saffron, and Del Cossa. 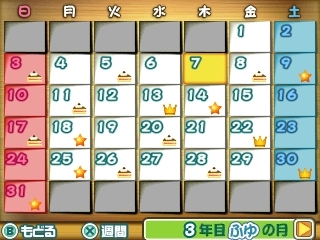 The only festival where you have to specifically choose which towns' events you want to participate on is the New Years celebration on Winter 31. Each town has their own version of the celebration and you can only join one of them. The festival names below are from the Japanese version of the game. English changes are expected. For competition festivals you'll be crowned the festival winner if you meet the contest's winning criteria. The prize you will receive for being more awesome than anyone else will depend on what type of festival you are competing in. With game-type festivals you may receive two prizes: one for your team being the overall winners and one for being better than anyone else participating in the festival. For your team victories you will receive a unique prize based on where the game took place. These will be cooking recipe sets or clothing outfit sets. For your personal victories you will receive random item prize such as colored pearls, Rice, gems, and so on. With competitive festivals the prize you receive will be based on the rank you were judged under: beginner, veteran, expert, or legend. Beginner-ranked winners will receive a random prize in line with the type of festival you are participating in. Animal contests can reward you with animal feed, crop festivals can reward you with fertilizer, the pet festival can earn you treats and pet-boosting potions, and so on. If you do move up in ranks and compete in anything higher than veteran, you can receive unique prizes depending on the festival. The Animal Festival, Fashion Show, Cooking Contest, Harvest Contest, and Pet Show have a pool of prizes based on the rank you took first place in and the number of times you have won in that rank. Prizes are awarded in sequential order and NOT randomly. For example, your first victory in the veteran rank Animal Festival will always reward you with the Black Eyepatch clothing accessory and the second will be the White Eyepatch clothing accessory. Once you win all of the prizes from a rank you'll start winning prizes from the lower rank; win all the prizes from the veteran rank to start automatically winning prizes from the expert rank while still participating in veteran-rank competitions. If there isn't a pool of prizes anymore, you'll receive random item prizes. It will take at least 15 in-game years to win all of the clothing prizes from the Pet Show, as the contest only takes place once per year. Clothing cannot be traded by other players via Connection Island. Upgrading your item brand will increase the price of the goods that you ship. The higher the brand you have for that specific item, the more money you'll earn for selling that item. The festivals that will affect your items brands are the Harvest Contest, Animal Festival, and Cooking Contest. Each time you win a festival using a specific product, you'll increase the brand associated with that product. Your first win will earn you the bronze rank, then silver, gold, and finally Platinum. Winning a festival with a Platinum-ranked item won't earn you any additional benefits. When it comes to increasing a brand associated with a crop, you'll just affect that specific crop and certain processed goods associated with that crop. For example, winning the Harvest Contest with a Pineapple will increase your basic Pineapple's ship price and the price for Pineapple Jam. For Animal contests, brands will affect products associated with that specific animal. Winning with your Jersey Cow will increase profits from Jersey Milk, Jersey Yogurt, and HQ Jersey Cheese, but it will not affect normal Milk or Buffalo Milk shipping profits. With the Cooking Contest, winning entries will increase the brand associated with that category of cooking recipe (e.g., win using a Turnip Salad and you'll increase profits with all Salad category dishes you ship). If you participate in a full-course meal contest, you'll increase your rank in all of the categories you cooked food in.